Barring any last minute challenge, the three domestic airlines that suspended operations last year, will resume by the third quarter of this year. This is the indication coming in from the Ghana Civil Aviation Authority. [contextly_sidebar id=”PSsJXkJWgx7nOunC2Ds6mbYs0EksYfvA”]The three, City Link, Fly 540 and Antrak Air, withdrew their services for varied reasons. 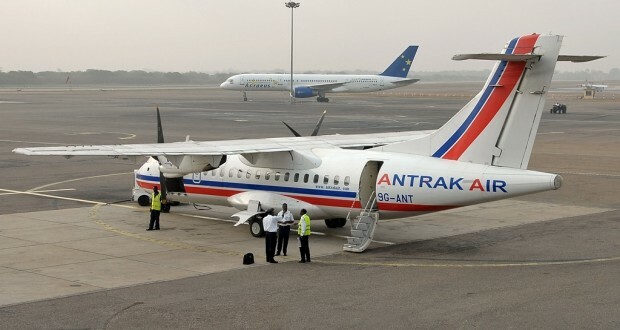 Antrak Air for instance, suspended its operations following its indebtedness to Swift Air over a wet lease agreement. Fly540 Ghana now Royal Fly GH, suspended operations as part of a restructuring exercise. Players of industry have raised concern over their long absence as that impacted heavily on traffic and revenue to the aviation sector. The Manager of Business development and Statistics of the Ghana Civil Aviation Authority, Reverend Stephen Wilfred Arthur, tells Citi Business News all three airlines have made progress to enable them commence operations by the third quarter of this year. “In the case of fly 540 there is a change of ownership apart from the change of name and the intent to rebrand the airline and so it had to go through some re-certification and also there are security concerns amidst other things that have to be done especially with regards to Fly 540 now Royal Fly Gh. In the case in the case of Antrak Air, there have been no changes that have been brought to our notice. I do know that they intend changing their logo and doing rebranding. City Link equally we do know that for certainty that they are making serious strides to come back before the end of the year,” he said. “To be very buy accutane online roche objective, the second quarter will be very challenging; I would prefer looking at the third quarter looking at where they are now.” Rev. Arthur added. Royal Fly-Gh, initially Fly 540, officially stopped operations in Ghana in 2014. The company following the decision, also asked about a hundred of its workers to go on an administrative leave. According to the airline the move was to help it restructure its operations. A change in ownership in 2015, saw a change in name and branding that included new colors and new logo. Royal Fly-GH then FLY 540 was incorporated in Ghana on 10th November 2008 and was given a certificate to commence business on 11th November 2008. It started operating internal flights from Accra to Kumasi, Takoradi and Tamale from the year 2012. The airline later introduced two sub-regional services to Abidjan and Freetown. The local airline in June 2015, announced that it was suspending its operations for three months due to a wet lease arrangement with Spanish airliner, Swift Air to use its ATR 72-500 Turbo Prop aircraft. Although it was expected to commence operations in October 2015, it was unable to do so though it had hinted of plans to secure its own aircraft after clearing debts owed Swift Air for the wet lease agreement. Citylink started scheduled domestic flights in Ghana on 18 September 2003 under the name CiTylinK Airlines. It however suspended commercial flights operations in August 2012 for various reasons.